Thomas Chen, DVM, DACVO, is a clinical assistant professor of small animal clinical sciences at University of Tennessee, where he also earned his DVM. He completed a small animal internship and comparative ophthalmology residency at Colorado State University. His clinical interests include all aspects of clinical ophthalmology but especially treating cataracts and corneal disease. Anansa Persaud, DVM, is currently completing a rotating internship at Long Island Veterinary Specialists in Plainview, New York. She earned her DVM from Saint George’s University and enjoys volunteering for the Wildlife Conservation. Figure 1 Optic neuritis in a dog. The optic nerve and its associated blood vessels are hazy with indistinct borders, as the vessels are elevated relative to the retinal blood vessels surrounding the nerve. In cases of bilaterally affected animals, owners often report suspected vision loss based on a clinical history of the pet bumping into walls or objects, missing treats, or having difficulty with stairs. Astute owners of pets with unilateral disease may report more subtle changes (eg, visual deficits, anisocoria with the dilated pupil in the affected eye). Absent menace responses, with absent pupillary light reflexes and mydriatic pupils, are usually noted on ophthalmic examination.1,5 Further vision testing (eg, visual placement testing, maze) can help confirm lack of vision. Optic neuritis is often diagnosed by confirmation of blindness and pupillary light reflex deficits and visualization of an abnormal optic nerve head on fundic examination. Other important rule outs for blindness can include diffuse retinal detachment (in contrast to focal detachment proximal to the optic nerve head) and sudden acquired retinal degeneration syndrome. Retinal detachment can also be diagnosed on fundic examination, whereas sudden acquired retinal degeneration syndrome can only be confirmed with an electroretinogram. Performing a complete neurologic examination and obtaining a thorough history are also recommended to assess for concurrent neurologic signs that might be suggestive of meningoencephalitis. Optic neuritis in dogs is most often the result of immune-mediated and/or inflammatory brain disease, which together comprise approximately 80% of optic neuritis cases in a study of 96 dogs.1 Other causes in dogs include infection or neoplasia. Optic neuritis in cats occurs secondary to infectious6-9 or neoplastic causes,5 with no reports of immune-mediated causes or incidence rates for all causes in cats. In contrast, veterinary ophthalmologists have historically considered optic neuritis (in patients without concurrent neurologic clinical signs) a separate clinical entity from MUE.2 A difference in signalment in canine patients with isolated involvement of the optic nerves has been reported; MUE patients were typically female small-breed dogs, whereas isolated optic neuritis patients were often male medium-to-large–breed dogs.1 The exact relationship or difference between the syndromes, if it exists, has not yet been definitively determined. Infectious diseases, with tropism for or involvement of the CNS, have also been reported to cause optic neuritis. Infectious optic neuritis usually manifests as an extension of more generalized or multifocal meningoencephalitis or from ocular and orbital involvement. Fungal disease in particular can involve the orbit or neighboring areas (eg, nasal or sinus cavities) and may result in subsequent involvement and inflammation of the optic nerve.1,12 Viral diseases (eg, distemper, tick-borne encephalitis virus, feline infectious peritonitis) affect the nervous tissue directly or indirectly via damage from host immune responses. These diseases can also result in uveitis (both anterior and posterior) or chorioretinitis (not necessarily associated with the optic nerve), the presence of which should raise clinical suspicion of infectious disease as compared with immune-mediated meningoencephalitis. Infectious disease testing should be conducted based on clinical suspicion from history and signalment (eg, unvaccinated animal, use of tick preventives), geography (for fungal disease), tick exposure, and exploratory bloodwork. Primary optic nerve tumors, including optic nerve meningioma and gliomas, have been reported, although they are rare.1,5,22,23 Orbital neoplasia can also affect the optic nerve. In a case series involving 53 neoplastic cases, carcinomas were seen most commonly (30%), followed by sarcomas (20%), lymphoma (15%), and presumptive meningiomas (17%).5 Carcinomas and sarcomas were noted to occasionally arise from neighboring areas of the orbit (ie, frontal bone or sinus, nasal cavity, maxilla) that extended into the orbit with involvement of the optic nerve. Optic neuritis may also occur secondary to orbital inflammation, including retrobulbar cellulitis and/or abscessation, which can be associated with infection, neoplasia, foreign body, or dental disease.5,8,19,24-28 If inflammation is severe or near enough to the optic nerve, compression or inflammation of the optic nerve can result in subsequent blindness. Clinically, these conditions can be observed as change in the position or placement of the eye (eg, enophthalmia, exophthalmia), protrusion of the third eyelid, and/or difficulty or pain on opening of the mouth, with periocular swelling and inflammation. Optic neuritis secondary to orbital or retrobulbar inflammation can be unilateral depending on the laterality of the primary disease (eg, unilateral in bacterial retrobulbar cellulitis). 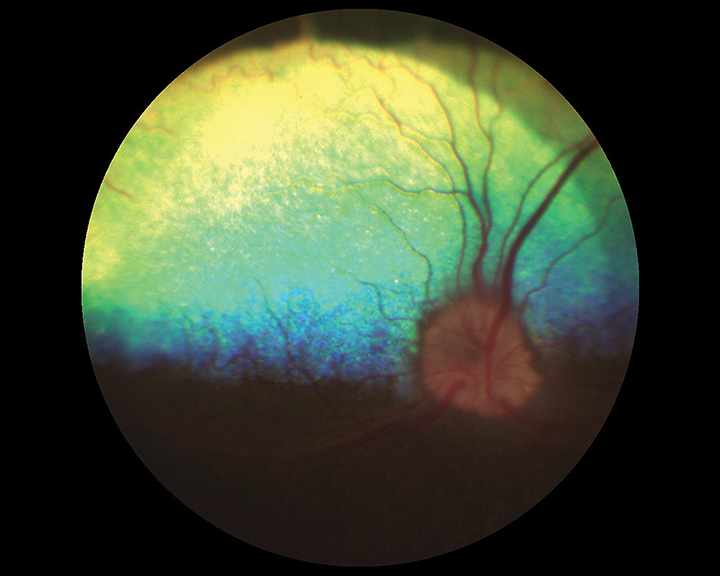 Ultimately, treatment of optic neuritis depends on the underlying cause. Because immune-mediated causes largely predominate, treatment typically involves short-term immunosuppressive doses of steroids (Figure 2). Partial or full return of vision was noted in approximately 30.6% (22/72) of dogs in one study1 and 64% (7/11) of dogs in another.4 Return of vision 1 to 2 weeks after initiating therapy for acute blindness has been noted (author experience). Figure 2 Same dog as in after a month of prednisone and cytarabine treatment. The margins around the optic nerve are still indistinct but much improved. Vessels overlying the nerve can be clearly seen and are in the same plane as the surrounding retinal blood vessels. Immunosuppressive doses of steroids can be detrimental if an underlying infection is present and may mask clinical signs or delay diagnosis if an underlying neoplastic disease is present. Any indication of orbital disease should be closely investigated before initiating steroidal treatment. Ideally, infectious disease should be ruled out, with specific testing conducted before initiating steroidal treatment, and an MRI and CSF tap performed to definitively rule in immune-mediated optic neuritis. However, if regaining vision is a priority and immune-mediated disease is suspected, empiric treatment with steroids can be initiated, as long as owners are educated regarding the risks. Specific treatment for infectious disease or neoplasia will vary depending on the causative or suspected causative agent. Prognosis varies depending on CNS involvement and severity of primary disease but, for vision, is generally considered poor. Martins BC, Brooks DE. Diseases of the canine optic nerve. In: Gelatt KN, Gilger BC, Kern TJ, eds. Veterinary Ophthalmology. 5th ed. Ames, IA: Wiley-Blackwell; 2013:1460-1461. Nell B. Optic neuritis in dogs and cats. Vet Clin North Am Small Anim Pract. 2008;38(2):403-415, viii. Grozdanic SD, Kecova H, Lazic T. Rapid diagnosis of retina and optic nerve abnormalities in canine patients with and without cataracts using chromatic pupil light reflex testing. Vet Ophthalmol. 2013;16(5):329-340. Armour MD, Broome M, Dell’Anna G, Blades NJ, Esson DW. A review of orbital and intracranial magnetic resonance imaging in 79 canine and 13 feline patients (2004-2010). Vet Ophthalmol. 2011;14(4):215-226. Davidson MG, English RV. Feline ocular toxoplasmosis. Vet Ophthalmol. 1998;1(2-3):71-80. Doherty MJ. Ocular manifestations of feline infectious peritonitis. J Am Vet Med Assoc. 1971;159(4):417-424. Trivedi SR, Sykes JE, Cannon MS, et al. Clinical features and epidemiology of cryptococcosis in cats and dogs in California: 93 cases (1988-2010). J Am Vet Med Assoc. 2011;239(3):357-369. Percy DH. 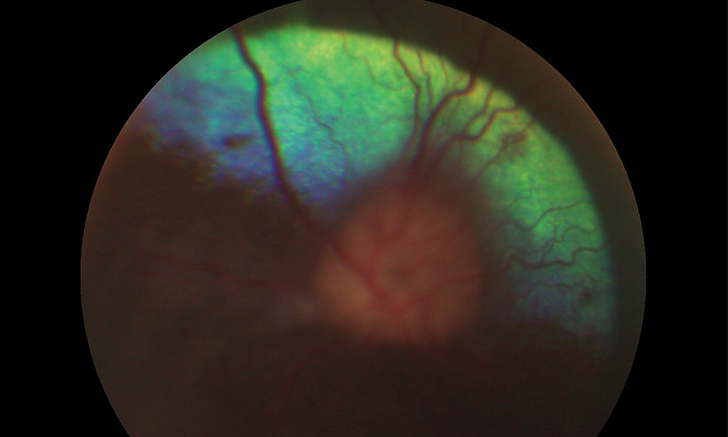 Feline histoplasmosis with ocular involvement. Vet Pathol. 1981;18(2):163-169. Adamo PF, Adams WM, Steinberg H. Granulomatous meningoencephalomyelitis in dogs. Compend Contin Educ Vet. 2007;29(11):678-690. O’Neill EJ, Merrett D, Jones B. Granulomatous meningoencephalomyelitis in dogs: a review. Ir Vet J. 2005;58(2):86-92. Malik R, Wigney DI, Muir DB, Gregory DJ, Love DN. Cryptococcosis in cats: clinical and mycological assessment of 29 cases and evaluation of treatment using orally administered fluconazole. J Med Vet Mycol. 1992;30(2):133-144. Richards TR, Whelan NC, Pinard CL, Alcala FC, Wolfe KC. Optic neuritis caused by canine distemper virus in a Jack Russell terrier. Can Vet J. 2011;52(4):398-402. Thomas WB, Sorjonen DC, Steiss JE. A retrospective evaluation of 38 cases of canine distemper encephalomyelitis. J Am Anim Hosp Assoc. 1993;29:129-133. Stadtbäumer K, Leschnik MW, Nell B. Tick-borne encephalitis virus as a possible cause of optic neuritis in a dog. Vet Ophthalmol. 2004;7(4):271-277. Leiva M, Naranjo C, Peña MT. Ocular signs of canine monocytic ehrlichiosis: a retrospective study in dogs from Barcelona, Spain. Vet Ophthalmol. 2005;8(6):387-393. Dubey JL. Toxoplasmosis and neosporosis. In: Green C, ed. Infectious Diseases of the Dog and Cat. 4th ed. St. Louis, MO: Elsevier Saunders; 2012:806-827. Meadows RL, MacWilliams PS, Dzata G, Delauche AJ. Diagnosis of histoplasmosis in a dog by cytologic examination of CSF. Vet Clin Pathol. 1992;21(4):122-125. Baron ML, Hecht S, Westermeyer HD, Mankin JM, Novak JM, Donnell RL. Intracranial extension of retrobulbar blastomycosis (Blastomyces dermatitidis) in a dog. Vet Ophthalmol. 2011;14(2):137-141. Bloom JD, Hamor RE, Gerding PA Jr. Ocular blastomycosis in dogs: 73 cases, 108 eyes (1985-1993). J Am Vet Med Assoc. 1996;209(7):1271-1274. Kline KL, Joseph RJ, Averill DR Jr. Feline infectious peritonitis with neurologic involvement: clinical and pathological findings in 24 cats. J Am Anim Hosp Assoc. 1994;30(2):111-118. Mauldin EA, Deehr AJ, Hertzke D, Dubielzig RR. Canine orbital meningiomas: a review of 22 cases. Vet Ophthalmol. 2000;3(1):11-16. Naranjo C, Schobert C, Dubielzig R. Canine ocular gliomas: a retrospective study. Vet Ophthalmol. 2008;11(6):356-362. Wang AL, Ledbetter EC, Kern TJ. Orbital abscess bacterial isolates and in vitro antimicrobial susceptibility patterns in dogs and cats. Vet Ophthalmol. 2009;12(2):91-96. Kneissl S, Konar M, Fuchs-Baumgartinger A, Nell B. Magnetic resonance imaging features of orbital inflammation with intracranial extension in four dogs. Vet Radiol Ultrasound. 2007;48(5):403-408. Hendrix DV, Gelatt KN. Diagnosis, treatment and outcome of orbital neoplasia in dogs: a retrospective study of 44 cases. J Small Anim Pract. 2000;41(3):105-108. Grahn BH, Szentimrey D, Pharr JW, Farrow CS, Fowler D. Ocular and orbital porcupine quills in the dog: a review and case series. Can Vet J. 1995;36(8):488-493. Ramsey DT, Marretta SM, Hamor RE, et al. Ophthalmic manifestations and complications of dental disease in dogs and cats. J Am Anim Hosp Assoc. 1996;32(3):215-224.